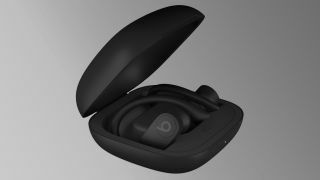 Rumors of Apple working on a wire-free version of the Powerbeats sports headphones has been making the rounds recently, and hidden within the code of Apple’s latest mobile operating system update is an image and an animation for what we now know to be the Powerbeats Pro, as first discovered by 9to5Mac. The new AirPods competitor looks similar to the Powerbeats 3, minus the cable connecting the ‘buds. Compared to the one-size-fits-all AirPods, the Powerbeats Pro design is sportier, with adjustable ear clips and interchangeable ear tips. This workout-friendly design could make it popular with those looking for a more secure fit to use with not just iPhones, but the Apple Watch as well. It is as yet unclear whether the Beats-branded charging case offers wireless charging, but it does seem like it will charge via a Lightning cable and not microUSB. According to the original rumor (via CNET), the Powerbeats Pro will boast Apple’s new H1 wireless chip that debuted in the AirPods 2 last week, meaning the new Beats headphones could offer hands-free ‘Hey, Siri’ support. There’s no indication as to when the Beats Powerbeats Pro will launch, or at what price, but given the imagery shows a completed product, we’re hoping the wait won’t be too long. We’ll keep you updated as soon as we know more. The new AirPods aren’t really the AirPods 2, are they?